Religious Zionist rabbis demand that Jewish Home and National Union unite to one list in hopes to add Otzma Yehudit. 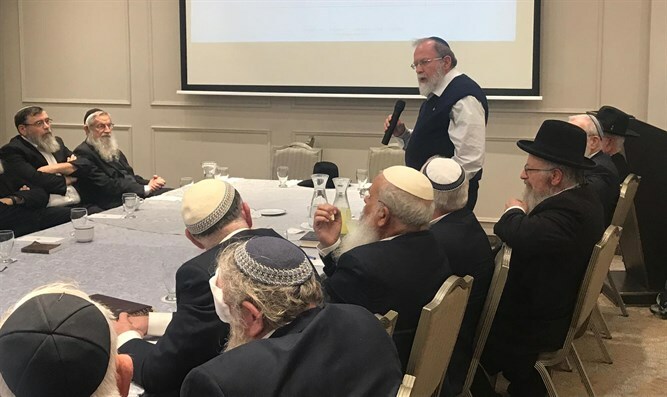 The rabbis of the religious Zionist movement gathered in Jerusalem today demanding that leaders of Jewish Home and National Union parties, Rabbi Rafi Peretz and Knesset Member Betzalel Smotrich announce unification of the parties ahead of the elections to the 21st Knesset. "All of us, all the rabbis, we will all support and stand behind the united party," they promised at the end of the conference. "The way to implement this unity will be done by practical people who know how to implement it as soon as possible in light of the pressing time. "We believe in the great power of the Torah-loving public, the People, and the Land - those who are interested in the restoration of the State and have tremendous responsibility and dedication to building Torah in all spheres of life. From this unity, we hope they'll be able as soon as possible to add the other parties that are close to this great spirit." The rabbis added, "We call upon the entire national religious public and all those who follow the path of religious Zionism to return home and give their vote to the united party."